The Portuguese banking system's non-performing loan ratio continued to decline, to 11.7% as of Q2 2018 (and 11.3% as of Q3 2018), after peaking at 17.9% as of Q2 2016. This 6.2 percentage points contraction in the NPL ratio is mainly due to a nearly 40% reduction in non-performing loans outstanding amount, compared to a 2.1% decline in total loans outstanding amount. According to the Bank of Portugal's data, 42% of the decline in the NPL ratio is due to write-offs. Sales and securitisations accounted for 23% of the ratio's decline. Nearly two thirds of the cleaning up of Portuguese bank balance sheets occurred via the removal of non-performing loans from the banking system. Moreover, the reclassification of NPL as "performing loans" more than offset the flow of loans that turn non-performing. 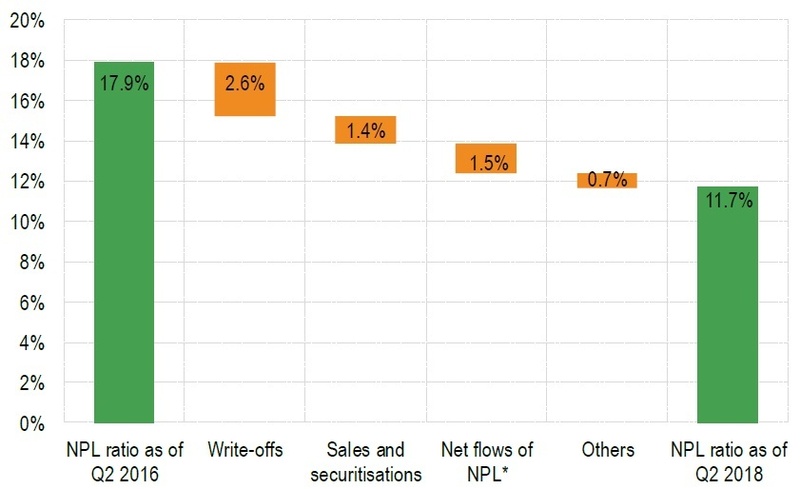 The net flow of non-performing loans contributed to a 24% reduction in the NPL ratio. Breakdown of the decline in the NPL ratio in Portugal between Q2 2016 and Q2 2018 *Net flows of non-performing loans correspond to the difference between loans turning non-performing and NPL reclassified as "performing loans", as well as amortisations and foreclosures. The remaining 0.7% is, for example, linked to net flows of performing loans.